The U.S. Mint in 2014 created dome-shaped commemorative coins to recognize the 75th anniversary of the National Baseball Hall of Fame. New legislation is seeking square coins in 2022 to celebrate the 75th anniversary of the integration of baseball. Newly introduced legislation is calling for the United States Mint to strike square commemorative coins in recognition of the 75th anniversary of the integration of baseball in 2022. On April 15, 1947, Robinson debuted for the National League’s Brooklyn Dodgers and on July 5, 1947, Doby integrated the American League with the Cleveland Indians. The Integration of Baseball Commemorative Coin Act is seeking up to 50,000 $5 gold coins, no more than 500,000 silver dollars, and a maximum of 750,000 half-dollars in collector qualities of proof and uncirculated for issue during calendar year 2022. These coins would be square with the design corner aligned. Reverses (tails side) would share a common image depicting a baseball diamond. A competition would determine their obverse (heads side) design, which would also be shared across each coin with the stipulation it be emblematic of the integration of the game of baseball. 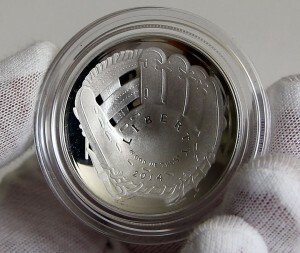 The United States Mint already has some history in striking unique baseball-themed coins. In 2014, the agency produced popular curved-shaped commemorative coins celebrating the 75th anniversary of the National Baseball Hall of Fame. Final designs for the proposed coins would be selected by the Secretary of the Treasury after consulting with the National Baseball Hall of Fame and Museum, the Jackie Robinson Foundation, and the Commission of Fine Arts. They would also be reviewed by the Citizens Coin Advisory Committee. Under terms of the legislation, a surcharge of $35 per gold coin, $10 for each silver dollar, and $5 per half-dollar would be added to each coin sale. Collected funds, provided the commemoratives turn a profit, would benefit the National Baseball Hall of Fame and Museum and the Jackie Robinson Foundation. The Integration of Baseball Commemorative Coin Act is sponsored by Senators Tim Scott (R-SC) and Cory Booker (D-NJ) and Congressmen Roger Williams (R-TX) and Cedric Richmond (D-LA). Sen. Scott introduced the Senate version, bill S.3239, on Wednesday, July 18. "So often through our nation’s history, sports have helped unify us during times of trouble and tragedy. Talent, sweat, and perseverance are colorblind, and today’s recognition is a testament to those who fought so hard for the integration of America’s favorite pastime," said Senator Scott. "I am thrilled to play a small role in honoring these legends in our history books." A House version is yet to be published. For any bill to become law, it must pass in the House and Senate and get signed by the President. Only two commemorative coin programs are authorized per year.